Cycling to work gives employees more time, more money and improves health and life expectancy. With such great benefits to be had it is no surprise that record numbers of employees are getting on their bikes and cycling to work every day. An analysis of the last census showed that 760,000 more employees in England and Wales are cycling to work; a rise of 17 percent since the last time the census was conducted. The government is now encouraging people to purchase bikes under the Cycle to Work scheme, which offers a 42% discount on a bike and easy payment terms. Cycling has never been a more attractive option and the upward trend in cycling to work looks set to continue. This summer ESE Direct commissioned a survey to explore the motivations for cycling and to find out what employers can do to make commuting to work by bike a more attractive prospect. Our cycling survey was conducted on a sample size of 690 respondents, of which 653 participants cycled to work. Over 70% of respondents commuted to work on journeys over 5 miles, with the average distance covered between 5-8 miles. 82% of the 690 respondents who took part in the survey said that the feasibility of cycling to work is a consideration for them when changing employment. Employers can therefore gain a significant competitive edge in recruiting and retaining employees, simply by providing better facilities for cyclists. Employers who fail to provide basic on-site facilities to cater to cyclists could be losing the best staff to competitors, as this is clearly a major consideration for cyclists when looking for new job opportunities. What do cyclists want from their employers to make cycling to work more viable? Many cyclists spend hundreds of pounds on a bike, so it is important for employees to have somewhere safe and secure to leave their bike while at work. At the very least, employers should provide cycle storage racks to ensure employees can securely lock their bikes during working hours. 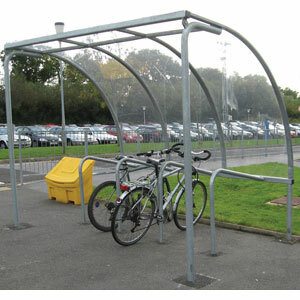 If there is sufficient space, installing a bike shelter provides additional security as well as sheltering the bikes from the elements. Employers can also provide financial incentives to employees to encourage cycling. The popular cycle to work scheme is a government initiative which allows employees to buy their bike tax-free and have monthly instalments taken directly from their salary. Our survey also showed that 68% of cyclists would be encouraged to cycle to work if their employers provided changing rooms and showers. It is clear to see the benefits of this for those that have a long commute, and how the provision of changing rooms can make cycling to work a more attractive prospect. What motivates cyclists to cycle to work? There are many factors that motivate employees to cycle to work; however it is the health benefits which are the primary motivation for leaving the car at home and cycling to work every day. An overwhelming 95% of survey respondents cited the health benefits which come from cycling as the major motivation for cycling to work. Studies comparing the health benefits of cycling to the risk of injury or death on the road show that the health benefits greatly outweigh the risks. This 2010 study found that - on average - the benefits of cycling outweigh the risks by 9 times. A simple change to cycling to work every day can add 3-14 months to life expectancy if people cycle rather than taking their car out for short distances. 69% of cyclists also said that the financial savings motivates them to cycle to work. The cost of car maintenance and fuel has soared in recent years and the monetary savings to be made from making the switch from driving to cycling are considerable.Bike Week’s cycling calculator showed that cycling 4,000 miles per year - a typical amount for someone commuting to work 8 miles each way, five days a week – provides a saving of £1,800 per year. The time saved by cycling is also an important factor, as many people beat the traffic jams and get to work quicker by bike. Over 50% of respondents cited time as a motivational factor for cycling to work every day. The benefits of cycling to work are clear and our survey highlights the importance that employees place on bike facilities at work. If employers provide a host of cycle facilities such as changing rooms, showers, lockers and most importantly, secure bike storage areas, many more employees are likely to get on their bikes and get fitter and healthier. Having a fitter and healthier workforce will more than make up for any outlay on providing cyclist friendly facilities!